Now, The main reason why this happens is that the registry in Windows 10 has en entry which was not removed when you removed the older printer with the same name. The trick is to remove that entry from Registry and get rid of this error. So, here are the easy steps to fix this error. Note:- Before Making any changes in the Registry editor, just Go File -> Export and Take a Backup of the Registry settings. 1] Press Windows key + R to open run. 2] Now, write regedit in it and press enter key. 4] Now, Delete any Registry key present in the right side which has same name related to the Old printer name. 5] Now, Close the Registry Editor. 6] Now, Press Windows key and R together to Open RUN again. 7] Now, type services.msc in it and Hit Enter. 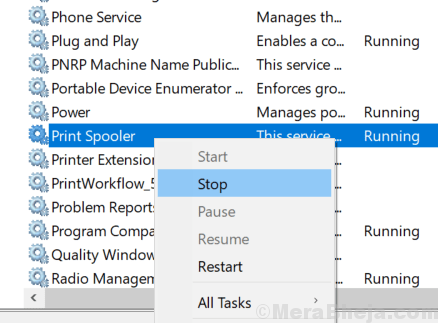 8] Now, Find Print Spooler service. 9] Right Click on it and Click Stop. 10] Right click on it and Click start. Lets Hope your problem must have got fixed.